Comprehensive suite Create your best work with a comprehensive toolbox of user-friendly features for graphics, layout, illustration, tracing, photo editing, web images and art. It’s perfect for all levels of design experience! Enjoy easy-to-use applications like CorelDRAW Home & Student 2018 and Corel® PHOTO-PAINT® Home & Student 2018, plus the new capability to directly upload to WordPress from within the product. You’ll have everything you need to design with confidence and achieve stunning results every time. Versatile design features Unleash your creative potential and explore intuitive tools to express your unique style and delight your family, friends and teachers. Find all the features you need, including the new capability to add perspective to bitmaps and the new functionality of aligning and distributing nodes for time-saving controls to position objects with precise alignment. Intuitive workflow Complete your projects with streamlined tools and settings, making workflow and tasks simpler. With extensive file compatibility and support, you’ll print or share with ease using popular file formats. Our new touch friendly UI workspace allows you to complete projects more proficiently with an extra responsive design experience, and you can accomplish designs faster with full support for Windows 10, stylus improvements, multi-monitor viewing and Ultra HD 4K displays. 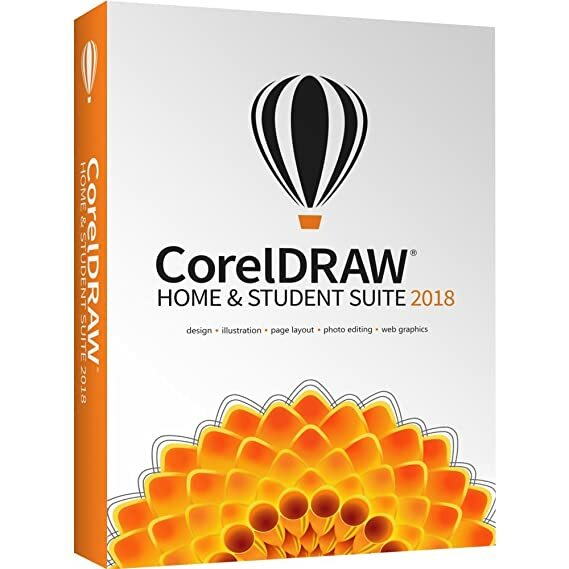 CorelDRAW Home & Student Suite 2018 has a restricted end user license agreement and cannot be used for commercial purposes. If you intend to create commercial projects for use in any business, please choose the full version of CorelDRAW Graphics Suite 2018, which permits commercial use and includes much more content and additional professional features geared towards the professional user.